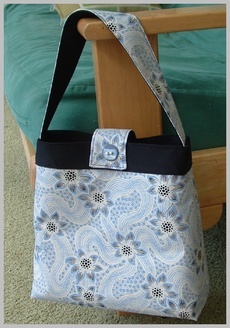 I've been motivated this week by the too-small, but kinda cute anyway bag I made last weekend. Here are the two I came up with this week. The brown one is my favorite--I've been using it since I made it (so much for stockpiling christmas presents). I LOVE the soft brown moleskin fabric I used for the lining. Heavenly. 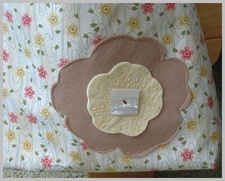 And it was fun to do the embroidery on the felt flower, and to use one of my favorite vintage buttons! The only bummer is that it needs some kind of clasp (and what's up with no local fabric stores carying those magnetic snaps? Huh?). And then, the blue/black bag is fun, but I made the mistake of using black fabric for the lining, so you can't find/see anything in it. The worst part about that? 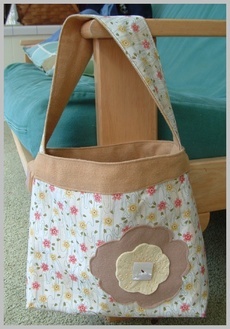 I made that same damn mistake just a few months ago on my Amy Butler Nappy Bag....will I ever learn?